DME Micro is a fabless semiconductor company focused on making simple things smart. Our System-on-Chips deliver ultra-low power wireless solutions across Internet-of-Things applications, including beacons, remote controls, human interface devices, wearables, portable power, LED lights, Smart Home, and Proximity & Find-Me devices. DME Micro brings wireless connectivity through low energy Bluetooth technology, a simple-to-use and universally supported platform on all the mobile devices you already own. The DME 1018 SoC delivers Bluetooth v4.2 with mesh specification. Devices with v4.2 can sync faster, are cloud connected and more power efficient. 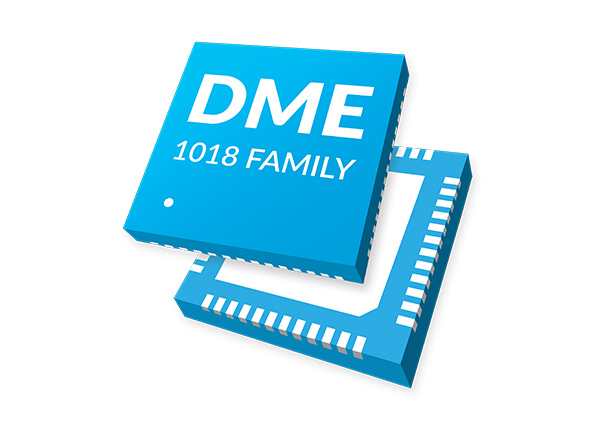 The DME 1018 Family increases product integration to simplify design and cut external components. Add Bluetooth connectivity while lowering bill-of-materials. Our chips can give you the freedom and architecture to transform your ideas, no matter what you want to build. Redesigned from the ground up, our chips are engineered to give you a leading edge in the market. Our premium features drive exciting user experience for your products. With 3 years of battery life, you can stop recharging constantly or scrambling for new batteries. Want to control your products from room-to-room? Our extended RF range helps limit dropped connections. And connect your products directly to an app and the internet with our IPv6 Ready connectivity. You'll have access while on-the-go. Get in touch if you're looking to build products with wireless features and need to maximize battery life. Whether you're a manufacturer, product developer or engineer, we work with your business to help differentiate your devices and delight your customers.